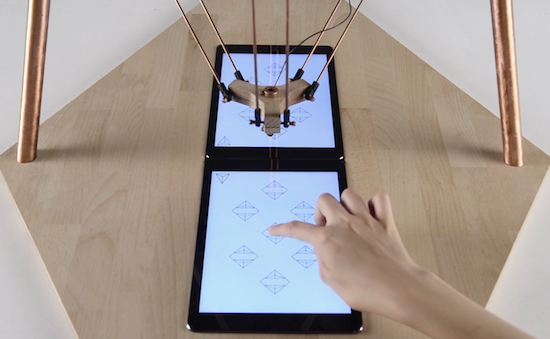 Interactive designer Alexia Léchot has built a delta robot with a ‘personality’ that interacts with humans through iPads. 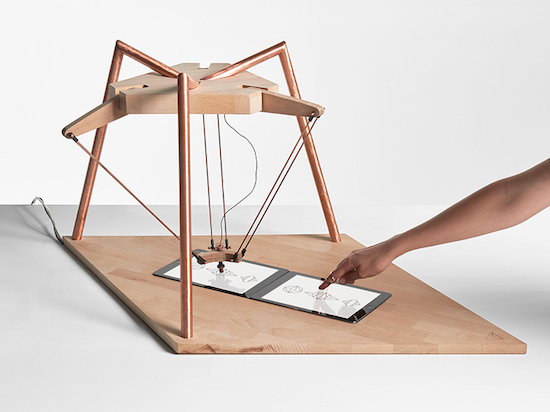 Deltu uses three moving arms, a couple Unity3d applications, and Arduino to play simple mimicking games. The system uses two Unity3d applications where the application of the human sends HTTP request to the computer. There is also a Python server that sends the string through the serial to the Arduino which controls the robot. The other player must precisely copy Deltu’s movements because it “is very demanding.” If not, it might change its mind and will shake its arms in a side-to-side motion that appears to simulate frustration. From there, Deltu leaves the game and opens the camera app instead, snapping selfies and posting them to Instagram. As you can see in the video below, the robot even takes a few moments to browse the social network’s explore section and follow a new account, as well as choose some tunes on SoundCloud. Depending on its mood, it plays with the user who is faced with an artificial intelligence simulation, who appreciates the small pleasures of life, sometimes too much. The relationship we have with robots/AI that have been created to enhance our performance, but have become a source of learning, is unique and exciting. The android’s place in ociety has not yet been defined and remains to be determined; for me it is the best source of inspiration. Intrigued? You can see Deltu in action below, and read more about the project on the Daily Mail.